Interim New Saints manager Scott Ruscoe hopes the Champions League qualifier success over Europa FC can help persuade the club's owner to hand him a permanent position. Ruscoe and Steve Evans have taken over from Craig Harrison who is the new Hartlepool manager. 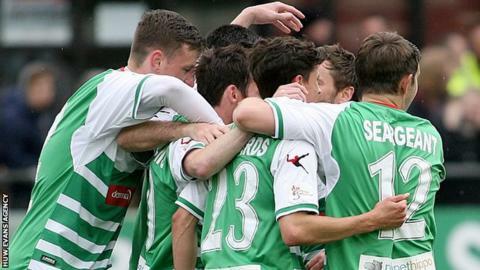 TNS defeated the Gibralter side 4-3 on aggregate and face Croatian side HNK Rijeka in the second qualifying round. "Hopefully we will be getting a go now," said Ruscoe. TNS trailed Europa FC 2-1 from the first leg and managed to win the second leg 3-1 after extra time against opponents who had two men sent off in the match staged in Portugal. Ruscoe will be waiting to see whether TNS chairman Mike Harris will give him and Steve Evans a long-term role. "A few people were waiting for us to slip-up," said Ruscoe. "We were the favourites, we were the seeded team and everyone was looking from the outside and thinking TNS should win this. "A few people were thinking Scott Ruscoe and Steve Evans were not up to it. "I am pleased and proud we have proved them wrong. It shows the players are behind us. "Hopefully we will be getting a go now as a management duo. "I will be speaking to the chairman and asking what his thoughts are." But Ruscoe insisted talks over his long-term future must take a an initial back seat and won't affect the preparation for the second qualifying round first leg against HNK Rijeka in Croatia on Tuesday, 11 July. "The team comes first and it's about preparing for next week," said Ruscoe. "This Croatian side are very good. We need to be at our best and worry about them, not the situation as me as manager. "It is going to be totally different again. We are under no illusions about how hard it's going to be. "We are going to have a plan and be prepared."